Halloween is one of my four-year-old son’s favorite holidays (naturally). He loves dressing up and he loves candy. Who doesn’t? He has had a Halloween party every other year and the request for this year’s party started as soon as all the Halloween candy and decorations hit the stores. Since Lucas has a new class at school he asked to host a party for this new class so they can all spend time together outside of the classroom. We opted on a Saturday from two to five (no longer nap time). It is great for me because I do not have to worry about proper foods and can actually focus on the party. Right when Lucas and I were figuring out what kind of party we were going to have, the Oriental Trading Company catalogue arrived. We looked through it together and we decided on a pumpkin decorating party, with costumes, of course. 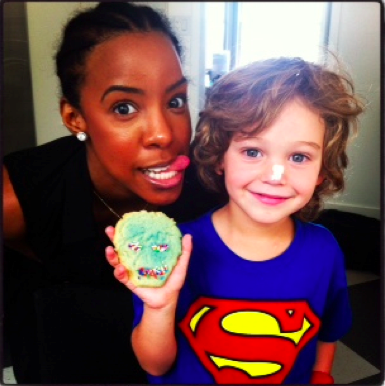 The next day, Lucas’ friend Kelly Rowland came over and baked cookies with him. She brought every decoration, topping, and icing, and inspired by that, Lucas asked if he could add cookie decorating as one of the activities. Then we went to our favorite website,AndersRuff.com and looked for party invites and printables. Next we made the list for the party. We invited his entire class plus three friends not in his class, and three friends from out of school, a total of sixteen kids. Since we were inviting the whole class, we gave out the invitations out at school so we didn’t have to mail them. Always go through your house to see what you already have that fits your theme. Our colors are naturally orange and black. We pulled out all of our orange and black stuff, set it on the dining room table, and looked through any leftover supplies from last year which inspired Lucas to want to set the dining room table in a fall, Halloween theme. I added a few candles, pinecones and fall flowers from our garden to finish it off. Always set up the party well in advance to make sure you have enough supplies. We moved our backyard around to make it work for kids and party-friendly. 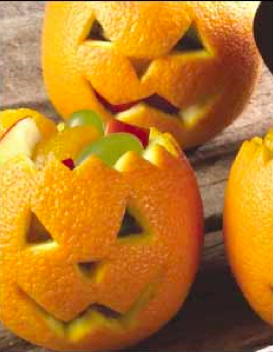 Decorations are so easy for Halloween because they have them everywhere from the supermarket to specialty stores. You can look online at sites like Anders Ruff and download printables for free. My friend Ali came over and brought Lucas the cutest garland fromMeri Meri. We hung it up between the living room and stairs early to start getting festive. 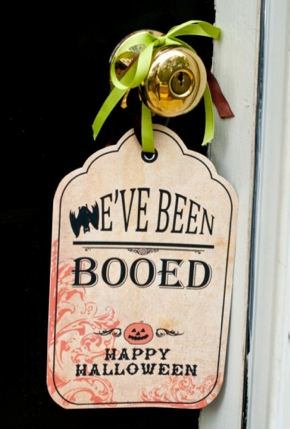 We also put a Halloween sign on the door that we printed from Anders Ruff. Everyone had an idea for DIY decorations this year. These are two that I loved so I thought I would share. Slice top off orange. Run a small knife or scraper around inside to hollow it out. Scoop out the orange segments and reserve for filling. Carve or draw (with non-toxic pen) a small pumpkin face on one side of the orange. Use a paper towel to gently soak up any remaining juice inside the oranges. Dice up fruit, including the reserved orange segments and fill each cup. Set the lid back on top and serve. My friend Ally Bernstein makes mummy candles out of mason jars that are super easy to make and add a festive touch. She takes gauze and pulls it apart so it’s holey and loose. Then she wraps it around the mason jar and glues the ends to stick. Put on eyes and they’re done! Candy, Candy, and more Candy. Buying variety packs and serving them in bowls is always easy and cute. But also get creative with traditional candy! In bowls of solid color candy such as malt balls, white chocolate covered raisins or pretzels, add some candy corn to spice it up. Buy Halloween candy but make sure you have healthy snacks as well. I like Popchips because they are a healthier alternative to chips and kids love them too. We baked the orange flavor cookies at home and used cookie cutters to cut them out in Halloween shapes. We used Stevia instead of sugar and gluten free flour. They still tasted great. Buy the cookies and then decorate accordingly to the Halloween theme. We used Honest Kids juice packs. They are Honest Tea's line of organic, low-sugar, fruit-flavored juice pouches and come in flavors like “Appley Ever After” and “Goodness Grapeness.” We also had plenty of waters. We used our Halloween glasses we bought at target from Lucas’ first Halloween party and we filled them with coconut water from Vita Coco and served them on a tray. We had Good Greens nutritional bars in the chocolate peanut butter flavor. Make sure all your kids can eat peanuts. Popchips in sweet potato and barbeque flavors. Hammond’s Lollipops are a favorite of Lucas’s they make a huge variety of classic candies that are perfect for Halloween like the Halloween Art Candy, uniquely handcrafted hardy candies into fun Halloween shapes like ghost, pumpkins, and Frankenstein, and the festive All Natural Black and Orange Lollipops. They are hand-pulled, twisted, and shaped using classic Halloween colors of orange and black, perfect for party décor or guest favors. Fruit Skewers that we decorated to look like Halloween shapes. Lucas and I went to the pumpkin patch and bought mini pumpkins for the kids to decorate. We hired our friend Jillian Yee-Pham from 2 Hearts B1 to do arts and crafts with the kids like pumpkin decorating. Jillian is a great designer who specializes in creative services like event design, presentation, and calligraphy. The cookies and the pumpkins were the perfect gift bags for the kids to take home. Hire a photographer or be your own and send all of the guests’ pictures from the party in a framed card after the party as a remembrance.